Below please find a sampling of some of the emails we have received from our adoptive families. Good afternoon Christina: We see that you have been quite busy over the past few weeks...they are both beautiful litters. I just wanted to give you a quick update of Jazz (pictures will follow soon when my wife uploads them from her camera). She has been a pure joy to be with and is full of beauty and brains...something I get complimented on every day while on her walk or going to pick up Gabrielle at school. She has almost doubled her weight since her first vet visit (April 4----17.1 pounds...June 1-----32.8 pounds) and loves her doctor. She recently saw another vet because her usual vet was on vacation and she told me that Dr Clark must be impressed with Jazz's demeanor and overall structure and health because there were exclamation points all over her paperwork. I never did ask you the weights of the Mom and Dad but by the looks of her front paws she looks like she will be a big girl! She still has her puppy fur on the sides of her belly, but her top coat has filled in with the adult wavy hair. She is just drop dead gorgeous and as you know could be a show dog anywhere. She is finally done with all the shots for a year and is in the 4th week of puppy training where she is usually the star attraction. We will have her spayed at 6 months. We next will get her certified in a Good Canine Citizen program offered by the AKC and then eventually agility training when she is older and has stopped growing. As she did with you as a pup, she is by my feet as I type this quick note to you. We love her dearly and could not be happier! Thanks again. Hi Christina, I hope this email finds you doing well. Just want to let you know that Lola is doing fantastic, she just finished staying with her Grandparents for 8 days and we can't believe how much she has grown. It almost seems like she has doubled in size. Everything is going well and she is happy healthy and weighing in at 22 lbs. Tonight she will be going to Puppy School - they use her for demonstrations all the time. Very smart and low key dog, she just can't get enough love and attention and she is always with us. I will have some pictures for you shortly. Hi... We just wanted to let you know that Hugo is doing well in his new home. He was so well behaved on the way home and is extremely good on the leash. He figures things out so quickly. Not much seems to faze him and he's adjusting to all the action of the city. We have already heard that he is the "cutest puppy EVER" from passersbys on our walk last night. He loves his crate and is always taking in his favourite toys (even if they dont' really fit - See attached picture). He goes in and out on his own. However, he was really upset last night to find out that he was closed in for the night. We didn't know that such a small puppy could make such big sounds!! Eventually he settled down and when we put him back in after a washroom break, he made one little bark and then went to sleep. I hope this is a good sign. Good news - He's already figuring out the word "sit", although we're still working on "drop" :) His favourite treat so far seems to be ice cubes. He loves sliding them across the floor and chasing after them. Today, we may introduce him to the other rooms in the house and maybe try out his puppy pool. It's not the lake, but it's water! I hope all is well with Beauty, Simson, Josh, You and everyone else. We really wanted to thank ALL of you for taking such good care of Hugo. His confidence with trying new things really shows that he was brought up in a safe, caring environment. THANK YOU! We will be in touch. Take care! Christina: Jake is doing Fabulous! He is an incredible joy! You did a great job with him. Heather, our Golden Retriever has been ignoring him as much as possible. When they play ball together, Jake pulls on her ears and bits her fur and she just pretends he doesn't exist. She's just getting to know him. They went for a couple of rides in the back seat of the truck this weekend. No problems. The cat has absolutely no use for him though. She's snarling and making tiger noises whenever he comes around. Basically she's in hiding. We watch him to make sure he doesn't get close, because he wants to play with her. He's going to the Vet this afternoon to get signed in with his records. I'll keep you posted. Very professional job on your part with everything! Five Stars! Thanks again. Hi Christina: Maisie is doing great. We enjoyed all of last week together, as I took the week off. She is such a funny character and is starting to become more confident with us. She has been doing well in her crate at night and has been doing pretty well on her housetraining. It is so funny, she LOVES the cat and wants to play with him. He, howevever, is not so sure how he feels about her, but has been extremely patient. Last week, she met tons of our friends and family and just loves people. I think she misses her litter mates though. I wish we had another puppy for her to play with. Once she has her shots we will enroll her in a puppy play group, which will be great for her. Hi Christina: Frisco is doing great! He seems happy, and is adjusting well. He loves Aspen our lab--they have a great time together. I tried to email some pictures, but they would not go through to your email?? He is enjoying meeting all the family, and the neighbors. He is very outgoing, and has to see everything!! Everyone that sees him just loves him. He is not only beautiful, but very smart. He is enrolled in puppy classes that will start in a few weeks. I love how you taught him to sit when getting his food--great manners already! Christina: Well I have to say that your advice probably made all the difference in the world. Picking her up early made it possible for her to spend the day with us and play and have a great time, so by the time bedtime rolled around she was nice and sleepy and content. Of course each night we stroke her head until she drifts off to sleep, so that might help too! I have no doubt that she would have been missing her family terribly if we hadn't gone through all those steps. She has been the best little puppy. She is such a doll. I don't think you could have chosen a better fit for us. You were right when you said she's a very special girl! I'll send more pics when I get a chance to download them from the camera. If you have any of her baby photos that you could send, that would be great! Dear Christina: ...Our dear, special Lake is bringing us such joy! Thank the Lord that we have him and that his spirit came into our lives when it did. THANK YOU A THOUSAND TIMES OVER FOR HIM. He never ceases to amaze me with his sweet, special, funny, smart personality. Just watching him gives us joy. I've attached a few photos of him with Jackson. We'll send another one just of him so that you can see him better. We've just come inside from another adventure outside here and they are both napping on the cool tile floor in the kitchen while I write this to you as I sit at the kitchen table. I did not work in the shop yesterday. We all went to a beautiful park nearby and took a walk along the creek, crossed wooden bridges, met some folks on their jog, saw some ducks, and heard some different bird sounds. He loved it all and walked so nicely beside Jackson. He's like 'a little man' already. I'm so in love with him and just seeing his smiling face and his joy in the every day warms me. He's got a great smile; others notice it, too, and comment about it. :>)). He's a happy, happy guy and the world is just one big playground. .....I can just visualize all of your 'pups' frolicking at the lake and how wonderful they all are. Wish I could be there to play with them and enjoy them. They are amazing goldens. Hi Christina: All is well here. Payton has adapted to his new family with ease. Everyone plays together and all have a watchful eye on the baby. My favorite is to watch Sophie and Payton play tug. Sophie lets him thinks he's winning. She could dominate so easily and just doesn't. Wrigley and Payton roll around and air bite. We just laugh. Their favorite time is nap time when they curl into each other and sleep. Katie, the 11 year old lets Payton crawl over her and give her kisses. That's a big deal as she doesn't adore little puppies. Klover, the 2 year old thinks she's 6 months. She wants to romp with the puppies and air bite with the best of them. Payton has had his shots and had a bit of reaction. He just wasn't himself yesterday, but has rebounded just fine. Did he have a reaction to his first shot? He weighs 14.2 pounds (he started at 11.5 pounds when he came). He is making great strides with housebreaking, and he started obedience class. He is by far the best behaved in class, and the youngest. He is a wonderful little guy. His appetite is much better, but not yesterday or today but that could be residual from the shot. He also has a little diarrhea again. I'm just going to wait it out for a few days. He doesn't have to get up in the middle of the night so it's not so bad. He sleeps all night in his crate in our bedroom. In the morning Klover and Sophie wake him up. They miss him overnight. I can't thank you enough for allowing us to adopt him. He is so endearing. Everyone who comes to meet him falls in love with him. Hope all is well with your gang. Say hi to Josh for us. P.S. Payton is snuggled with Katie as I write this! Hi ....Maxx is really quite amazing. He is so responsive and inquisitive....he misses nothing and learns so quickly. We have several neighbours who have adopted Maxx as their own dog and only allow us to take care of him. It is amazing how a puppy can attract the affection of kids to grandparents and Maxx is so charming yet independent. We are also amazed on how he has taken to house breaking as well as going into his crate at night. Molson wasn't certain what he thought about Maxx invading his space but has turned into a super big brother. He likes it best when they can sleep together but has become a caring good old dog. Maxx loves cuddling up beside him when he takes nap and Molson enjoys giving him the odd lick and smile. Well that's it for today and I will write on Sunday. Thanks again. Josh and Mum: Chose not to crate Skipper last night - I want the crate to be a happy place. My kitchen/dining is much like yours therefore not an issue. So, yes, I did get sleep last night. A bit of a clean-up this a.m. My fault! Left papers by the door but didn't think to leave them elsewhere. Once those were soiled he was looking for a clean spot. Wouldn't you? Good job too as yesterday and today have been very busy. Took him with us to the gym today (Mr. H. and I weight train once/week). The trainers all wanted to take him home! One fellow, Carey walked him while I trained, He was walked before we went and then I walked him again when we got home. At that point he was very tired so I chose then to crate him. Likewise mid afternoon friends came by kayak to visit knowing he came home yesterday and wanted to see our handsome fellow. I chose again to crate him after that. He is very smart! Great with ball and retrieving. Does the sit very well. I have softer flavoured nylabones which he gives a cursory play with. You warned me. He did eat better today but because I didn't feel he was eating enough, offered it dry and I found he preferred it that way. He also drank much more. At the moment he is out-cold on kitchen floor. We will do another good walk later but I have yet to do anything in the park as he does not have all his shots. Don't know if it matters but that is my stand on things. Bella is a very beautiful Golden with a very loving disposition. A credit to you and her parents Beauty and Simson. Having lots of fun. Just returned from our 2nd dog training 101 session. My little man is so smart learns something new every day. Last Monday his weight was 25lbs he is still all legs. His testicles are down now. Yesterday he lost two teeth on the top so cute. He loves to eat still on same food and K9 . He is losing the puppy fur and getting a nice coat. He sure is the star whereever he goes. The last two days he walks perfect by my side people are shocked to see such a young puppy walking and not pulling. He loves to walk so goes for many walks every day. Just a question on the food he gets a cup three times a day is that ok ? I just wanted to share a few pictures of Zoey. Zoey is fantastic- She is smart and energetic, but has such a lovely and endearing personality. I just wanted to say thank you! She is a joy! Just wanted to let you know that Cooper has settled in beautifully. He is such a gentle boy with a wonderful disposition. He has slept through the entire night from the first night we brought him home which astounds me! I am running so late right now, but I've been meaning to just jot a quick email to you and tell you how much I LOVE Titus! He is an amazing little guy. He is such a delight and remains a giant cuddler. He is growing into an extremely handsome guy and is finally catching up to his nose (we were calling him "Pinocchio" for awhile!). I know he will be beautiful - that is a given. But he is really a special boy. Unbelievably sweet and gentle. Thank you for him! Sorry for the delay in update but we have been busy with the flea issue.The end point is he is fine and we will now get our grass treated just in case. We saw the vet this morning for our 9 week injection and check-up. He weighed in at 18 pounds, and is in "magnificant shape'!! I have meant to write to you so many times about this wonderful boy, but something (usually he or the children !) got in the way. He is an amazing dog with some human qualities that make him the envy of all who meet him. He has been a great friend to our four boys, and he is particularly good at playing center field in soccer. Hockey is his best sport and he takes great joy in beating the boys to the puck and running off with it! He is patient, very calm ( as he rolls around the floor with the boys) and LOVES company. He is SO well suited to our family, for which we shall be always in your debt, as he is rarely on his own, out and about with me most of the time.He loves the water of course, but has only taken a couple of baby strokes at this point. He is a wonderful companion to me -and a great listener! His training is going well, each boy spends 15 mins with the trainer at home and practices individual tasks with him. From the start he was so easy- house training in 3 days, waiting calmly if it was required, understanding so quickly what was being asked of him.He is an absolute joy to have with us and is such a part of the family, that we even miss him when he gets picked up once a week for his outdoor dog camp, where he romps around with other dogs, especially the Retrievers of course. We will continue to update you on his progress and I know you would love to see a photo of him. I shall enlist the help of my boys for this and see if I can get one to you. He is a drop dead gorgeous lad!! Well, I know you are SO busy with the pups and we follow their progress, as we used to follow his. Just thought I would give you a little update. Wendel is doing fantastic. He's grown already! The first night as you mentioned was the worst. Now he is sleeping his nights and wakes ready to eat. We are quickly learning his habits, as he is ours. So long as we get him outside as soon as he wakes up, we're accident free! He's even starting to ask to go out. He's amazing with the kids. It's very apparent that he came to us well socialized and excellent with little ones already. He loves to be around people. We're having lots of fun! Chase is seemingly quite comfortable in his new home. Taylor can't keep her hands off him, but he's eating and sleeping just fine. He and Cali are getting to know each other. There are occasional bouts of jealously, but Chase knows how to handle it. In fact, he holds his own quite well. Right now, they're napping right next to each other. He's such a nice boy - very calm and sweet. More to come once I connect the camera to the computer. Sophie's doing great!! continuing to charm everyone she meets! I will send some pictures the staff took today at work when they email them to me. She is perfect. She already looks bigger, and gained 1¼ lb since I weighed her on Tues - she was 15.5 lb today! She is braver and bolder exploring the house and the yard with confidence. She has met so many people and loves all of them, and is loved back in return. She is doing the stairs in and out of the house with ease, and is walking well on a leash. For the first day or two she seemed to nap restlessly, but it was my day off yesterday and she settled in great with her naps. She played hard, and then slept hard on and off throughout the day. She is having a great time with the boys, who have made it their mission to play with her and tucker her out. She goes most places with us and continues to be a great traveler. We are going to visit my dad near Hamilton this weekend, so she will be doing a long car ride again. Hello Christina- Hope you are well. Thanks so much for this wonderful dog. Leo is an intelligent, calm, happy, and beautiful puppy. Training has been going well - he already knows sit, down, sit/stay, down/stay, come, touch (touches hand with nose), watch (look at me), crate, mat, wait, and is getting better on a leash - and he's not even 4 months old. You have done a remarkable job selecting your dogs and raising/socializing your puppies. Everyone we meet is amazed by his calm demeanor. Thanks again for everything. Good afternoon from Tucker!! As you can see, he found an old tennis ball left behind by our last goldens..and like the perfect retriever he is, I actually had him running and bringing it back to me before he found a nice stick to chew on instead! Christina, handsome Tuck is just a dream boy...and thank you for his peanut butter in the kong idea..he loves it and did not make a peep when I left it in the crate yesterday upon leaving the house. We are just amazed at how long he stays clean in the crate at nite...last nite we were tired and put him to sleep at 10pm and he was still asleep when my husband let him outside at 7:30am...and not a cry during the nite..only a few minutes of whining when he is put in the crate! Thanks again and hope you do not mind all my emails and pics..You do not have to answer as I know you must have so much to do with your growing family! I know where to reach you when I have important questions!!! Hello Christina! How are you? Just wanted to give you an update on Charlie. I cannot tell you how much of joy he is. He is as smart as a whip, a real cutie pie but it is his happy and sweet personality which is his best quality. He and Boomer have mellowed out (a bit) and don't play constantly anymore. However Boomer lets him do anything to him and has not yet put him in his place. I imagine as Charlie gets a bit older Boomer will put his foot (make that paw) down. I don't know if all of your puppies are this amazing or if Charlie is just very special but we are totally enjoying him. We just wanted to send you a quick update and let you know that Gus is doing great! He has been such an incredible addition to the family. I know I have said this many times but I just canÂ’t get over how well behaved he is. VERY laid back which is perfect for us. He plays outside with the boys or goes for walks with Lori and I and we never have to worry about him. He is always right by our side and we rarely even need to keep him on a leash. We donÂ’t have to worry about him chewing or having an accident in the house. He seems to already have all of that down. Of course he is curious and will put things in his mouth from time to time but he knows which toys are his and he sticks with those. He and Lilly (our Shih Tzu) have become very good friends. She didnÂ’t know what to think of him at first but now they are best friends. He is growing everydayÂ…I think he is going to be a big boy. He was 24 pounds at his vet visit on Friday. I never did ask you but how big are Steele and Lilly? We laugh every time we feed him because he still eats like he is fighting all of his brothers and sisters for a meal. He eats half the bowl before it hits the ground snorting and growling the whole time. It is hilarious. We finally got the puppy gold in the mail and he has been on that for a few weeks now. but now he is doing great. Overall, I just canÂ’t thank you enough for sending us exactly what we were looking for. Thanks again for a wonderful dog! He is perfect!! You must be getting ready to say goodbye to your second Gulliver litter this week-end. It must be very hard for all of you. We thought you would like to hear the latest on Chudleigh. He weighed in at 33.8 this morning and is a lovely boy. He is now completely house trained, He brings the paper every morning,he has learned to sit when out walking when he sees a car go by and he knows to shake a paw and lie down. We are having some trouble getting to stay on command but we think that is all amazing for such a young age. We are leaving him for two weeks while we go on our Mediterranean cruise and we are going to miss him terribly. Hope all is well at Dreamkeeper and that you get some rest after the last puppy leaves. I just wanted to send you a quick note now that Sadie has turned 1 year old (Sept. 3rd, 2011). I am sorry that I have not been in touch recently to let you know how she was doing. When we last spoke we had been having difficulty with Sadie suffering from separation anxiety every time that we would leave the house. With your help we were able to work through that and now after having Sadie for a year we realized that the problem all along was that she didnÂ’t require to be locked up in anyway and a cage and pen were what was upsetting her. Once we gave her free reign of the house she had no issues whatsoever (which went against everything that I had read but she just appeared to be smarter than other dogs). Really it is difficult to describe how much Sadie has become a member of our family. Sadie is so well behaved we are the envy of all of our family and friends. Nobody can believe how well we were able to Â“trainÂ” our dog and everyone asks for our secret training method. In actuality the dog has pretty much understood every word said to her since she was a puppy. Very little training was involved at all. I still take credit for being a great dog trainer, nobody knows my dog trained herself :) The fact that we are able to walk along the sidewalk for blocks without a leash and have the dog sit and stay and we can walk a mile away without a problem, this was not me, it was the dog. We have a busy neighbourhood, many dogs walking around and our beautiful retriever sits on our front lawn all day long and does not budge. We did not train her to do this, as long as she is with us she is happy. We recently brought her to our cottage on the French River. We hiked through trails, climbed hills, swam in the river and used the boat often. The dog never left our side, never a leash needed, ever. Sadie has become a favourite amongst all of the kids at my childrenÂ’s school. There is a line up to play with her each day when the bell rings and no matter what abuse is thrown her way the dog never moves. My daughter plays dress up with her often and poor Sadie can be seen with clip on ear rings, pearl necklaces and silk dresses for her to wear around the house. Never does she get upset with the kids or does she even walk away from them, she stays put and lets Hanna play with her all day if need be. We planned on registering her for obedience school but it just seemed like a waste of money. The dog does everything that she is told, there is no other training that I would want her to do. She is perfect the way she is. Thank you again Christina for giving us this beautiful dog. We could not have asked for a better friend to the family. We love her very much and we feel blessed to have her. I am emailing from work so I donÂ’t have a picture or I would have sent one to you. I will try to get one to you soon. Hope that all is well with you and yours. I wanted to share some pictures of Bentley and Sophie with you. We just love them so much. We couldn't ask for sweeter dogs. They have passed their puppy training with flying colours. They seem so quick to learn and eager to please. We start level 2 obedience training tonight. Everyone who meets them remarks on their beauty and temperament. They love walking down the boardwalk on the beach and getting the attention! They are having great puppyhoods as well. They both do separate walks and playtime, each day with other puppy friends but they truly love coming home to be with one another. Yesterday they visited the vet for their rabies shots. Bentley is just under 32 lbs and Sophie is 30.5 lbs. They received top marks for their condition. They are coming along nicely and the vet was very impressed at how calm they are. We have only had the occasional accident in the past few weeks so we seem to almost be through the housebreaking stage. Bentley loves to dig and has started our Spring gardening for us. Sophie on the other hand, can be a bit bossy with Bentley but she would much rather sprint around the back yard than dig. They are so much fun to watch. All is well and they are truly a joy. Take care and we will keep you up to date on our wonderful dogs! I am so sorry it has been such a while since I have emailed with an update and just wanted to let you know Finley is doing wonderful and is such a sweet boy! He loves going on long walks, chasing the frisbee in our backyard, stealing toys from the kids play room, perching on our couch, giving kisses and of course loves his nightly cuddles on our bed just before going into his crate at night! He finally cut all of his adult teeth and seems more content now that he is not constant teething! He is just finishing up his first obedience class and seems to be the STAR OF THE CLASS !! -so far he has been VERY willing and quick to learn just about anything we try to teach him - sit, down, stay, leave it, heal....I think he loves all the little rewards he gets ;) He still LOVES his food and was 50 pounds a few weeks ago when Josh weighed him-not sure what he is now but I assume he is between 55 and 60. It is hard to imagine he was just 12 pounds when I picked him up back in December! He seems to be almost fully trained to our invisible fence and loves "doing the crazies" as we call it around when he races around the yard, adores chasing the kids and loves to chase and eat bugs-ha! We can not wait to introduce him to the water this summer! I am sure it will be hard to keep him out of the water once he learns how to swim and know he is going to love going to my parents cottage in Pointe au Barril! I just uploaded some pictures to my facebook page - if you have time and want to take a look! He seems to be just starting to fill in a bit and is already quite the handsome boy! We can not get over how everyone stops us anytime he is out and about with us to comment at how beautiful he is! How is his brother doing? I can't believe that it is now 3 weeks since I picked up Ollie! We had our vet visit today and Ollie's second set of shots. He caused a real stir at the clinic and was SO much admired. The vet commented on what a beautiful-looking pup he is! He now weighs 17.4lbs, so is putting on weight steadily but not too fast, although, to me, he seems so much bigger and heavier now! Both our children are now back from college on spring break and they are really enjoying having him around and he is enjoying all the extra attention too! and still loves his cuddles! We have also been enjoying the extraordinary summer-like weather of the past 2 weeks. He is such a good boy. On the whole, he is very mellow and laid-back, though he has his moments when he careens around the yard, plucking the blossom off the weeping cherry and trying his best to decapitate the daffodils. Yesterday I had to try not to laugh when I left him outside momentarily, only to return to find that he had dug a gigantic hole in the flower bed and was sitting in it as if it was his nest that he was most proud of!! He is very happy in his crate, but I havenÂ’t left him for more than a couple of hours or so during the day yet. How is Miss Rosie doing? I hope that you are enjoying a certain amount of peace and quiet, now that most of the pups have gone to their respective homes. It must seem rather quiet around the place! I wonder if you still have snow, or if that has all gone now. The young Jaxon is doing great. He has pretty much mastered his pee/poo spot, comes and sits to command. What an intellegent little guy! I can say with certainty we have had interrupted sleep the last 3 nights but he settles back to sleep quickly after doing his business. He saw the Vet on Friday who declared him "perfect". What I enjoy the most is our cuddle time. He is very content being held while walking and sitting. We strolled along the beach yesterday and he took in the sights and smells. Today, he will go for a picnic with us as it is 80 degrees outside. Every once in a while, I see a look in his eye where I know he is thinking of all of you. Yesterday we walked past a group of young boys playing basketball and he seemed quite excited by their voices. I knew he had to think that Josh was among them. I will keep you in the loop as to how he is doing...... Please remember how incredibly indebted we are to you for your work with these animals. They are not merely dogs, they are life savers. Trying to send a little sunshine up your way! We apologize for how long it's taken us to give you an update on Arya, but as you can see below, she is doing very well! :-) I'm attaching more pics to follow from our walk this morning. She is sooooo smart! Already completely house trained at 15 weeks. She can sit, stay, and shake a paw...Her absolute favorite thing other than eating, or digging holes, is the beach!!! She absolutely LOVES it! Two more pics to follow, and we'll send you more from our next outing to the ocean this weekend. Thanks again for our wonderful dog. We are crazy about her! I wanted to let you know that Mr Blueberry, now named Buster is doing great. He is the sweetest little guy and has fit in perfectly with our family. He plays all day with Bella - they are getting along great! He does manage to get into a bit of trouble as Bella as taught him how to get into the planters and dig in the dirt. We've taken him in our spa a few times and he loves to swim. I can't wait until he has all of his shots and gets a little bit bigger so we can take him to the beach. He is very food motivated and no matter where he is, when he hears the pantry door open he comes running, hoping for treats. He also loves to help load the dishwasher and always try's to lick off the plates and silverware. I can't imagine not having him as part of our family! Thank you for picking out the perfect puppy for us. Jackson is becoming a wonderful Service Volunteer Dog in training. He has just completed Basic Hm Companion and starts Advanced next week. He is most definitely the "alpha" of your litter with Daisy/Baron. Head strong, sometimes stubborn, but extremely smart and massively strong. He is swimming on weekends and is very healthy. This is J.B. from Spokane and just wanted to say Merry Christmas from me and my little son Jackson. Not so little now. At last vet checkup he was at 75 lbs and I think maybe a pound or two more now. You know as I look at him as compared to his father Baron, he is almost a dead ringer for him. Jackson is simply one of the most beautiful dogs anyone around these parts or myself have ever seen. I have people all day everyday stopping me to compliment him and I have to tell you he is the real deal. I so enjoy just watching him work and stand looking at an object. When he is moving it is breath taking to watch his front muscle groups through his shoulders, so defined and cut. His rear flanks are the same. You can actually see each muscle working. A couple questions - At 11.5 months he has started to develop a separation anxiety when it comes to me leaving him for short periods of time. For example: He is so worried about being left at home he won't get out of the car seat. Or I get up to take the garbage out and he follows me to the basement then lays down by the exit door to,the garage. Is this something he will grow out of? Second question, he just doesn't engage his food like he used to. I will make home cooked roast beef with chicken and mix with his Dog kibble you got us on for puppy's but he simply won't eat for 24-36 hours sometime missing three or four meal times. Any advice? Hope you are well and I sure love my Jackson. You and Josh did a great job in the pairing. Just got your phone message so I thought I would respond by email with a pic. "Sunny" ( was this an exhaustive naming.... other names in the running were - Sunshine - Sugar - Snowball or Snowflake - Angel from our youngest - Ghost - and a few others ) has been the perfect puppy! Mild mannered and polite to any visitor and no real sleeping issues. Here is Sunny sleeping on Nicole down by the dock. We are so happy we found your wonderful puppies and especially happy that Cupcake / Sunny was available and has joined our home. At present she is sleeping right beside me while I do some work on the computer for a client. Sorry to bother you, but wanted you to know that Aimee is doing fantastic. She is such a doll and extremely smart. She started sleeping through the night on the fifth night with up to 8 hours a night. Amazing! She also has had just one accident in the house in many days. We are stunned by how quickly she learns and how well she behaves. She sits on command, will usually come when called and stays close by us at all times. She still sleeps a lot, but maybe that's because she's a growing pup. Of course, her razor teeth and curiosity are a wicked combination and require 24/7 watching, but it is little price to pay for the wonderful companion she is becoming. Again, from the entire Merck family thanks for our newest addition to the clan and please know that Aimee is being loved as much as any pup could desire. It is truly a privilege to have this little one with us. A marvel. What you do with it for 8 weeks is invaluable. She is afraid of nothing, she is socialized, loves to play. My son, Isaac 3 years, played a lot with her yesterday and this morning. It is as if she was born here. Everything went very well. She follows us wherever we go. Regarding the last night, we put her in a cage on the ground floor with Soy (my 7 year old cocker because she always sleeps there.) She cried a lot, so we set up cage in our room, it reassured her, she fell asleep after all. This morning, she got up at 5:15, it was clean the cage and I went outside. She went back to sleep until 6:30. I even bought a stuffed puppy that mimics the beating of the mother to feel a presence, for it facilitated the adaptation. I sign your contract today and I'll return it by mail. I have a question, is that you remove the water for the night or you keep it? And if you remove it, to what time you remove the water? Thank you a thousand times. I will send you pictures soon. Simon is doing great, he is a real sweetheart; gentle, calm, very easy going and very good natured not to mention gorgeous (beautiful). Jade and he get along great, I couldn't ask for better. He is perfect and very healthy (although he likes to put everything in his mouth and tries to eat almost everything). He loves the beach, water, boating and in general playing with Jade and us - I can't wait until he sees the snow. I call him my spanish prince. I thought that you may like a couple of pictures. Thank you for giving us such a great, perfect puppy. Thought you might like an update on the former Mr Cognac, now Finn. I have attached a few photos - hope you enjoy them. Finn is adjusting very well to his new life and family. We love him bunches. he is very smart and affectionate. He has learned several new commands, in addition to sit -- wait (aka stay), here (aka come), leave it and drop it. he is also coming along well with potty training. He is quite enamored with out other golden boy, Mack. Mack is very patient and enjoys playing with Finn. Our lab Camille thinks Finn is a full grown dog and sometimes will try to play with him as such - because both adults are so much bigger than Finn we only allow supervised interactions for now. Finn loves a good game of tug with either big dog. We have been taking him different places for socialization and introductions to new sights and sounds, and he handles that well. He travels in the car without issue and has been a star when going to the vet. All the staff there couldnÂ’t speak more highly of him and how handsome he is. Hope all is well with you. IÂ’ve been getting puppy chronicle updates on OpalÂ’s pups -- so beautiful. iÂ’m sure itÂ’s sad to see them all head off to their new families. WeÂ’ll send another update soon!! It was one week ago that we came and brought Sundance to our home. I will never forget picking her up from your wonderful place. I just wanted to let you know that everything you said about her was spot on. She fits perfectly with our family. She is gentle with the older dogs and they love to be with her. She is observant, and very smart. We are getting into a good routine. I have started some very basic training several times a day. Working on name recognition mostly. I do believe she understands. I have talked to my vet and she is on board with all your recommendations. It has been a fast week. I do hope your other dogs are enjoying the extra time you have to spend with them. Well, tomorrow marks one year that we have had Hope and what a wonderful year it has been.I canÂ’t tell you how much we love her and how she seems to capture the hearts of all who meet her. She is very special. You said that from the beginning and it is very true. We have attached a couple of recent pictures. Hope participated in her first Walk For Dog Guides this year and took quite a shining to a blind client named November. Also, as you can see, Hope loves Haley very much. Again, thank you very much for allowing us to adopt Hope. She brings joy to our lives every single day. Hope you and your family are all well and happy. I write to send New Years greetings and all good wishes from us and Luca -- who wanted to bid good wishes to Opal and Steele, his mom and dad, and to his Canadian family. We're sending a recent X-mas photo (sorry about the glare in his lights). He got quite exuberant about the Christmas festivities and we couldn't help letting him romp a bit on Christmas eve. He's thrilled by the sight of any glimmering objects so we prioritized safety this year and put christmas trees aloft. He's been the true delight of 2013 and our holiday season. Everyone admires not only his stunning looks, but his graceful, generous demeanor, his amazing sociability, and his desire to frolick whenever he can. His training is going very well and we're heading into our next class of Good Canine Citizenship here very soon. We want to thank you for making this possible for us. It's been sad to have our first Christmas without Mika, but this little guy has definitely helped us deal with our grief and look to the future. He's an absolute treasure. We wish you all of the best for 2014 and we'll continue to keep you updated on Luca's progress. Just a little note to wish you Happy New Year! Also to let you know that my boys (Baron and Bailey) are just about the most handsome and best boys one could wish for . I am so glad to have to have gotten my dogs from you!! Bear is a ray of sunshine. He is incredibly calm, very intelligent and such a happy puppy. In fact his name should be Happy. He spends most of his time following me or our children from room to room. He has adjusted to his new surroundings with incredible ease. He is sleeping through the night (because he is sleeping in our bed) Not a habit I plan on keeping but for now it's sweet and helping his adjustment. I think back to when you said he is a 'clown.' He IS absolutely a clown. He copies everything Harry does and loves to steal everyone's things including shoes, gloves, hats, has already been on morning walks with his friends. He is incredibly social and very curious. He has not left my side. I am just starting to help him realize he can not walk under and/or in between my feet at all times. I have been meaning to email you because I wanted to share this with you. Our Bear is an absolute treasure. He is an old soul that possesses a wisdom far beyond his years. He is kind, aware and sensitive. He is strong, proud and has great structure. His physical appearance is much like his dad Shiloh. Bear and I are very connected I could not imagine life without him. Today I was working Judy Emmert from Dealing with Dogs puppy training. She fell in love with him. She was so impressed with his temperament she was very interested in where I got him. I told her. She knew of Shiloh. She said the world needed many more Goldens like him. He is a lovely boy! I thought on this special day that we would send you a quick message. One year ago, we were so thrilled to hear that Snowy arrived safely in this world. We ar over the moon with her. She is incredibly sweet, well behaved and glued to us all day!! She has made many friends (her best buddy is an Australian Sheppard) and is enjoying life. Spoiled with lots of cuddles, she sleeps the day away and saves playtime for when the boys are home from school. And she loves watching TV!! Quite funny, sports, nature shows, westerns...she loves it all. I have attached some recent pictures. She looks like her mom!!! Hope all is well. Thank you so much for all of your time and continued support. We couldn't ask for a better dog or a better breeder! Greatly appreciated. I will try your suggestions. Regarding Emmy chasing the leaves, it is absolutely ridiculous how excited and hyper alert she becomes. I have never witnessed anything like it. I will try your suggestions. (It is quite hilarious to watch actually but not as funny when you are walking her on leash and she almost dislocates your arm!). She is so incredibly mellow in all other ways and has become literally the perfect dog for our family. We all adore her. Hi Christina! Hope all is well! Just wanted to check in and say hello and let you know Hudson is doing great! He is the best dog is the whole world and we are so thankful for him! He is HUGE!!!! Already 60 lbs and very active! He has been all over we took him to the mountains to play in the snow, he just has his first beach adventure last weekend and he has explored many of the parks in our area! Everyone loves him and he is very spoiled to say the least! I attached some pictures for you to look at he is absolutely gorgeous! Hope all is well for you and we just wanted to let you know that Hudson has a wonderful home with lots of love! Thank you so much for sending him to us we are obsessed with him! Take care! We are going to Minot which is 90 miles fr here once a week for obedience. It is alot of work but I really like it. When should I get her spayed? Was there suppose to be paper work on the chip? Tyson introduced her to boating last weekend and reported that she loved it. Not so sure of the water as of yet but that is fine with me as it has been a cold spring. I just wanted to give you an update to let you know that Willow is doing great! She is now 21 lbs and is getting much taller. She is such a sweet little girl and we get stopped all the time when we are walking her as people ask where we got her and commenting on how beautiful she is. Cameron and Madison love her so much and laugh at the funny things she does as she can be quite clumsy at times. She has made our lives brighter, that is for sure. She now knows the commands: sit, lie down, stay and drop it. When she retrieves something we have thrown to her, she runs back to us with the toy in her mouth, her tail wagging and jumps into our laps with the proudest look on her face. She is such a smart little girl. She loves her crate and hasnâ€™t had an accident in it once! She is fully trained to go outside and it took no time at all. I will send you some pictures when I get a chance. Again, thank you so much from the bottom of our hearts for such a lovely, sweet little girl. She is our princess and she knows she is loved. Hi! This is N** and A** in Chicago, the proud ma and pa of Bentley! He is now almost 7 months old - he is beautiful and sweet and well-behaved. and all the best in 2016! Btw, several people have asked who our breeder is and we shared your contact info with them. We are really thinking of getting a second golden from you so Bentley can have a constant companion. I will send a recent photo separately. I hope you and your family are well, I know that you are busy with your new litter. Congrats! They are all just as beautiful as every other one. I also saw that you had a successful pairing of Hugo and Juliet (must admit I'm a little jealous that I won't get one of these beauties, but nothing would make me want to go back and give up Indie)! On the occasion of Indie's 1st birthday, I just wanted to thank you again for entrusting us with this amazing puppy! Over the last 10 months she has changed from a shy little pup to a minx of a girl, into the beautiful young lady she is (as is evident in the attached pics). I could probably write a 10 page letter to tell you all the amazing things she has done and accomplished but I know you're busy :). Suffice it to say she is EVERYTHING we wanted and SO MUCH MORE. Not a day goes by that we don't get stopped and complimented on what a beautiful girl she is. She is happy, well loved, spoiled beyond belief in a good way (only pup ever to be allowed on the couch!!) and brings joy and sunshine every day to our lives! We are forever grateful to have become a member of the Dreamkeeper Family. I'm sure Indie would also want me to send you big hugs and love from her! 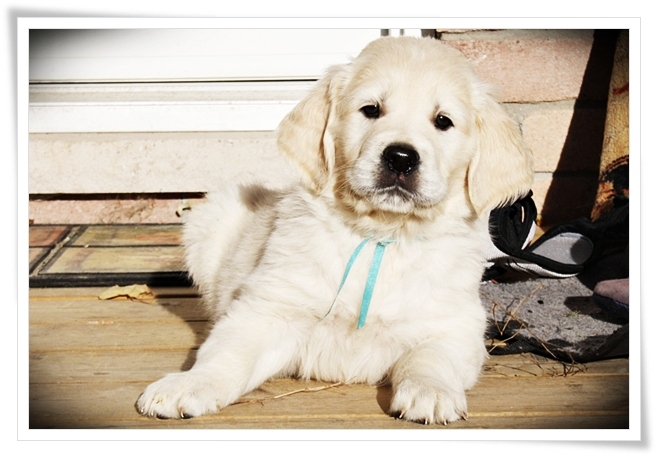 Having been to visit goldens at several breeders we can honestly say that Dreamkeeper goldens are the most beautiful and well taken care of dogs and puppies. Christina and family have a beautiful location and home to raise these wonderful dogs. I would highly recommend this breeder to anyone. I also urge everyone to visit breeders and see the facilities and dogs prior to agreeing to purchase a golden. They are not all created equally and in our mind, nothing comes to close to Dreamkeeper.